Dealer Sample Packs, are specifically designed for SME businesses and franchises to purchase a mix of the BOLT Locks innovative products. Each sample pack includes marketing material, products and an advertising freestanding sign with BOLT Lock. Orders over $600 receive free delivery and a BOLT Lock X Banner Stand to help you promote and sell the BOLT Lock in store. Best used inside out of the weather. 1600mm high x 600mm wide. High resolution print 720DPI. UV, water, scratch resistant print. B-Green stock which 100% recyclable. Lightweight frame and includes carry bag. Custom Print for Your Business. Orders over $1000 receive free delivery and a BOLT Lock Pull Up Banner Stand to help you promote and sell the BOLT Lock in store. Great for indoor and outdoor use. Silver Aluminum Base with Black Carry Bag. 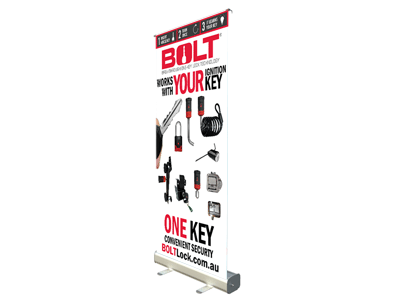 Add a Custom Image, BOLT Lock Australia is able to print an image of your choice onto the banner, to be displayed where the BOLT Lock Products are laid out on the Pull Up Banner. Add your business name, logo, phone number or website address at the bottom of each banner stand, there is no extra charge for this. Limit of 1 Free Banner per business. Register to receive a Free BOLT Lock Counter POP Stand and BOLT Lock Hitch Pin Lock. Register your business or organisation to gain access to Dealer Pricing and we will send you a FREE BOLT Lock Hitch Pin Receiver Lock with Key and POP Counter Stand. No Obligations to purchase and come with free delivery. POP Stand and Hitch Pin Lock can be seen on the right. Please note that the BOLT Lock Padlock is not included. Please note this is only available to retail businesses. To register please fill out the online registration form: Dealer Account Registration. Dealer Sample Packs , are specifically designed for SME businesses and franchises to purchase a mix of four (4) BOLT Locks innovative products. Dealer Sample Packs , are specifically designed for SME businesses and franchises to purchase a mix of eight (8) BOLT Locks innovative products. BOLT Lock Cable Lock - Mixed Carton , are specifically designed for SME businesses and franchises to purchase a mix of the BOLT Locks innovative products. 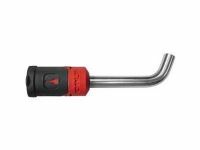 BOLT Lock Hitch Pin Receiver Lock - Mixed Carton , are specifically designed for SME businesses and franchises to purchase a mix of the BOLT Locks innovative products. BOLT Lock Padlock - Mixed Carton , are specifically designed for SME businesses and franchises to purchase a mix of the BOLT Locks innovative products. This BOLT Lock Retractable Banner has 2 Sizes available: 1600mm x 600mm and 2000mm x 800mm and uses photographic quality print and is UV, Curl and Water Resistant. 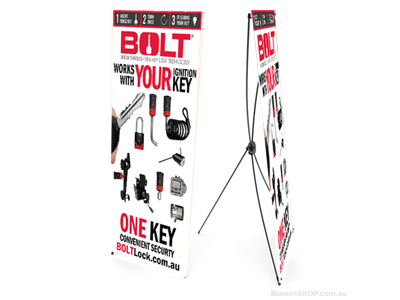 This BOLT Lock Retractable X Banner uses photographic quality print and is UV, Curl and Water Resistant. POP stand is 30cm x 30cm x 15cm and includes 2 side pockets and includes 150 Brochures are which and can be used to give away to clients in store or at events.